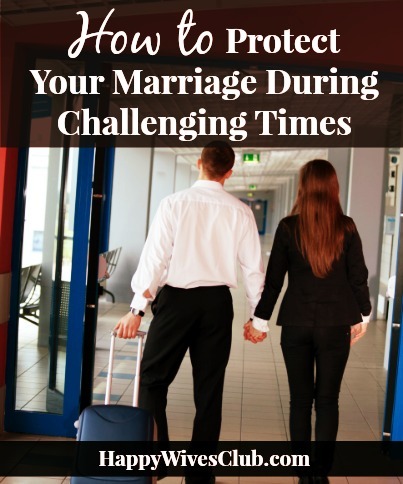 We all know how important frequent date nights are for keeping the fire burning with our spouse. 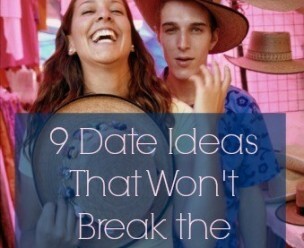 But when money is tight, or a babysitter is nowhere to be found, keeping a regular date night can be a challenge. We’re here to help! 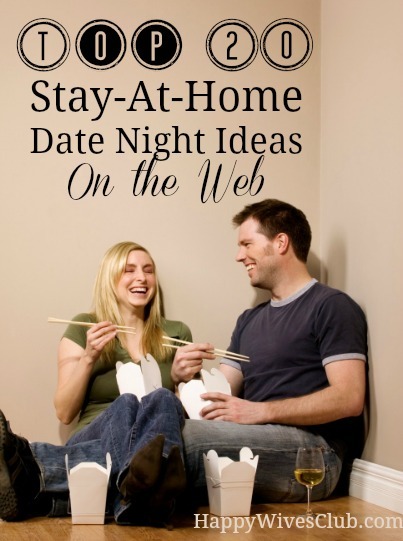 We’ve scoured the web, looking for the best, cheapest, most creative stay-at-home date night ideas and compiled a list of the top 20 we found online. 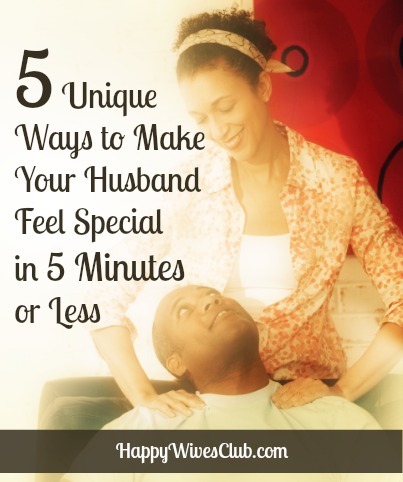 So grab your hubby, put the kids down for the night, and get your date night on! Iron Chef Chocolate: Make a meal with chocolate featured in every course. Who says chocolate can’t be served as a main course? You can either make a meal together or divide up the courses between each of you and surprise the other with your sweet & savory creations. Strip Trivia: Make it a hot night with this sizzling bedroom game. Tease each other with one steamy question at a time to set one another on fire! Make It a Theme Night! Choose a theme and center everything you do around it. For example, if you choose an Italian theme, you could eat spaghetti and gelato, then watch a movie like The Italian Job or Life is Beautiful. Some other fun theme ideas: Mexican, Asian, Christmas, Kid’s theme, 1950′s (or any decade), etcetera. Living Room Camp-Out: Get anything you have that makes you feel like your camping out and set it up in your living room (i.e. camping chairs, turn off the lights and use flashlights, blanket…). Make tin foil dinners in your oven for the dinner. Crepes in Paris (no ticket required): Spend an evening in Paris right in your very own home enjoying create-your-own-crepes and creative spouse caricatures. So fun! Create a DIY Photoshoot: When’s the last time the two of you were in the same photo? Using your tripod or Apple photo booth, snap pics together in various rooms of your home for memories you’ll never forget. Kid-Free Slumber Party: Make a cozy pallet for you and your spouse on the living room floor [with] lots of blankets, pillows, snacks, and movies. We call it a ‘slumber party.‘ It’s a little silly, but super fun and makes us enjoy the little things in life. All Dressed Up & Nowhere to Go: Pull out your nicest formal dress from your last cruise or even from your high school or college prom (if yours still fits.. good for you! I’m not even close to fitting into mine), light dozens of tea candles, and have a romantic, fancy dinner. Out of Character: Dress up as an actor from a movie and pick the character for each other (think Tom Cruise in Risky Business). Dream Date by Design: Design your own Dream Date with an easy survey! 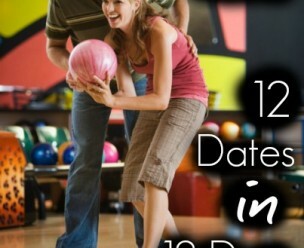 Have your sweetheart do one also, to create two amazing dates! Turn Your Bedroom Into a Love Nest: I purchased a bed canopy years ago. Occasionally I’ll pull it out, dust it off and put it up for the night. Then I fill the room with candlelight and other sundry romantic items and pretend that Mr. Beguiles and I are tucked away in a sumptuous hotel room or cottage somewhere. Dance the night away: It has all the intimacy of a club without the downside of slipping in spilled drinks. Rehash the days of the high school dance. Turn down the lights, turn up the music and be sure to dance two feet apart. Just kidding! Getting close is the point, and what better way to get close to your spouse than dancing in your own private gala? 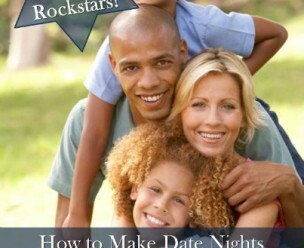 Vacation Planning Date: Turn planning your next vacation into a fabulous and fun date night with our great printables! Get a Taste of Another Culture: Plan out a delish meal of Paella and sangria, prepare it together and then dig in. Love Indian? Make your own Chicken Tikka Masala. 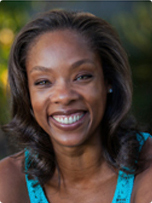 Write out the story of how you met (and fell in love): Better yet- video tape it! Your kids and future posterity will be so grateful and it is so fun to go back and read (or watch) years down the road. It’s amazing how much you will forget! Wine Bar at Home: Buy a few different bottles of wine (get 20 great picks under $20), make a plate of meats and cheeses, light some candles and load up your iPod with your favorite tunes. Something Old, New, Borrowed & Blue! Celebrate your lifelong commitment to your sweetheart with this “Something Old, New, Borrowed, and Blue” themed date! This date is a true celebration of love. Play the Newlywed Game! See how well you really know one another. Have prizes for every correct answer. You can check out some fun questions here. It’s a Love Match! Create some sparks with your sweetheart with this free printable that puts a romantic spin on the classic game of Memory! 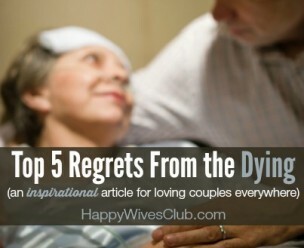 Didn’t find something on this list that floats your boat? Find an endless amount of creative and cheap stay-at-home date nights at my absolute favorite date night site: The Dating Divas. These fabulous ladies love their hubbies and have made a career out of sharing their awesome date night ideas with us.